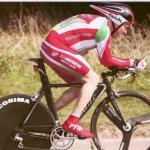 Time trialling appeals to cyclists because there are so many different aspects of competition. Apart from racing for the overall win, riders are at the same time racing to improve their personal best time at that race distance and their best time on that particular course. Often there's a time-handicap competition within the race too, in which riders are given a time allowance against the fastest rider. A further dimension for riders aged 40 and over is the “veteran's standard” competition, where riders are given a time allowance related to their age. 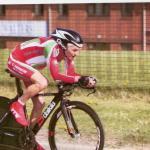 This enables time triallists to remain competitive into their seventies and beyond. This branch of the sport is governed by Cycling Time Trials, and dozens of events are held throughout the country under its rules. Race entry is cheap, and you don't need a licence in order to compete. Apart from “open events”, usually held at the weekend, which are entered in advance using standard CTT entry forms, there are many local mid-week “club events” which for which no pre-entry is required. Plus there are 12 hour and 24 hour events in which the object is of course to cover as much distance as possible. There also events for tandems. Specialist time trial bikes are very aerodynamic, with disc wheels, aerofoil-section components, and “aero bars” which allow the rider to adopt a very aerodynamic riding position. You don't need this kind of bike though – people usually start out on a standard bike and gradually upgrade as they become more involved in the sport. It's very easy to get started in time trialling and the club has lots of time triallists, so just get in touch if you'd like to find out more.